Hello World, this page showcases my published haiku. I’m not going to brag here and proclaim to be a haiku master, but what I will proclaim is that I surely believe that haiku should be enjoyed by all. And, of course I am so certain the only way to be remembered as a Haijin is to leave behind some legacy, no matter how it is written, whether traditional or modern. Well, consider this as mine. I hope you find my haiku interesting, because for me «Haiku is not just a once flash of lightning». My language here is haiku, so enjoy! Aug 27, 2012 – R’r 12.2 issue, page 18. August 17, 2012 – The Asahi Shimbun: Asahi Haikuist Network. July 20, 2012 – From the notebook- The Asahi Shimbun: Asahi Haikuist Network. Japan. 2012 – Frogpond 35.2, Haiku Society of America, USA. May 4, 2012 – The Asahi Shimbun: Asahi Haikuist Network. Japan. April 26, 2012 -The Mainichi Daily News, Mainichi Japan. as part of Haiga- The 99th. WHA Haiga Contest, 04/2012, Japan. April 15, 2012 – Haiku column in DIOGEN pro kultura magazine, Belgrade, Serbia. April 1, 2012 – SHARPENING THE GREEN PENCIL 2012 the book of the contest published by BIBLIOTECA ROMANIAN KUKAI, Romania. February 2012 – winning haiku in NAR Haiku Contest 2012, and first published in NAR- the Creative Works Journal published by the Campuswide Honors Program at the University of California, Irvine, USA. March 01, 2012 – The Asahi Shimbun: Asahi Haikuist Network. Japan. Featured/Published on the HSA “Haiku Wall” exhibited in the historic Liberty Theatre Gallery at the Quarterly National Haiku Society of America Meeting in Bend, Oregon on June 3-5, 2011 as part of the downtown Bend, Oregon First Friday June Art Walk; A winning haiku, The International Library of Poetry, 2006; Published in my poetry book «The Walking Man», Outskirts Press, 2007. Librasia – Vladimir Devidé Haiku Awards 2011 Grand Prize- Runner up, Japan. Haiku of Merit – Haiku on the Atomic Bomb, August 2010 From World Haiku Festival 2010 in Nagasaki Competition on the theme of the Atomic Bomb, Japan. Published on World Haiku Review August 2010. December 16, 2011 – The Asahi Shimbun: Asahi Haikuist Network. Japan. December 1, 2011 – A Hundred Gourds 1: 1, USA. November 04, 2011 – The Asahi Shimbun: Asahi Haikuist Network. Japan. October 21, 2011 – The Asahi Shimbun: Asahi Haikuist Network. Japan. September 2, 2011 – The Asahi Shimbun: Asahi Haikuist Network. Japan. August 11, 2011 – The Mainichi Daily News, Mainichi, Japan. July 2011 – Ripples — Haiku Society of America Newsletter, Vol. 26, Number 2. USA. June 16, 2011 – The Mainichi Daily News, Mainichi, Japan. May 19, 2011, Politiku: Trending Political Topics in 17 Syllable Observations, USA. May 20, 2011, Politiku: Trending Political Topics in 17 Syllable Observations, USA. 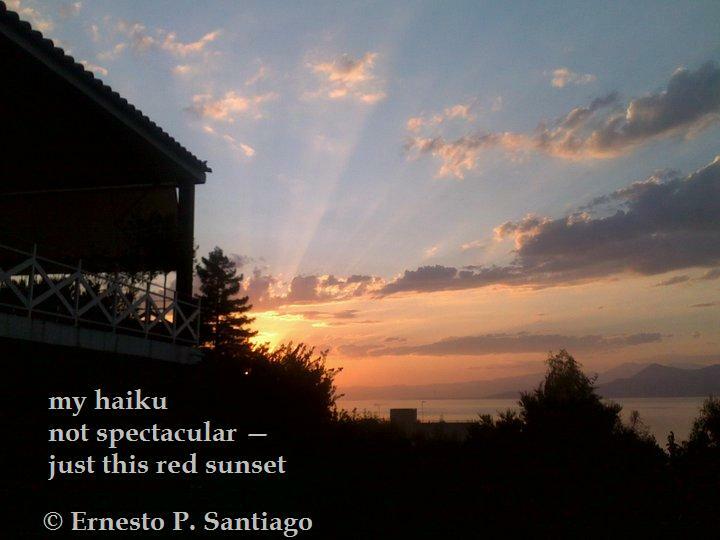 January 30, 2011 – The Haiku Foundation: Per Diem: Daily Haiku, USA. January 2010 – HAIKU DEL GIORNO – HAIKU TODAY – Cascina Macondo Associazione di Promozione Sociale, Italia.